Transient ischemic dilation (TID) is a marker of severe coronary artery disease (CAD). We aimed to assess the incremental value of TID in a cohort of patients with known significant CAD who had recurrence of symptoms after revascularization. We identified in our databases 104 patients who had recent coronary revascularization and recurrence of symptoms. 62 patients had PCI (75 arteries) and 42 patients had CABG (104 arteries). All had follow-up stress SPECT MPI and repeat coronary angiography. Myocardial perfusion findings of ischemia and TID were correlated with presence of significant obstructive CAD (>70% stenosis). Follow-up stress Tc-99m Sestamibi SPECT MPI revealed inducible ischemia in 38 patients (36.5%) and TID > 1.20 in 49 patients (47%). Subsequent coronary angiography showed significant obstructive CAD in 44 patients (42%). The sensitivity for detecting obstructive CAD was 61% for SPECT MPI alone, but increased significantly to 93% by the addition of TID as a diagnostic criterion (P < 0.0001). In this selected patient cohort with prior coronary revascularization, TID is an important marker of obstructive CAD and has incremental value over SPECT MPI alone. 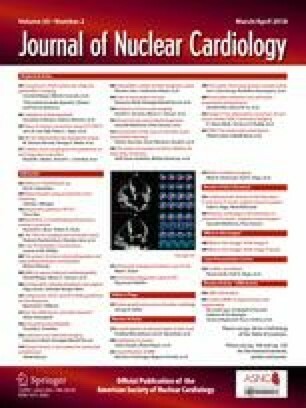 This article was finalized under the auspices of the “Mentorship at Distance” committee of the Journal of Nuclear Cardiology. We gratefully acknowledge the editorial suggestions by Frans J. Th. Wackers, MD, PhD. The authors declared no potential conflicts of interests with respect to the authorship and/or publication of this article. The authors received no financial support for the research and/or authorship of this article. The authors state that they have no proprietary interest in the products named in this article.